I'm going to be building a workbench, so I've been 'screw shopping.' 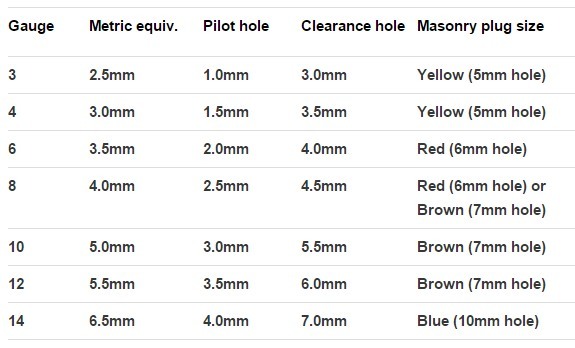 I need some explanation on the sizing of screws when they are advertised as (example) 6 x 3/4". I know that 3/4" is the length of the screw, but what does the 6 mean? Screws have three basic measurements: gauge, threads per inch, and shaft length in inches. So, you may also see a measurement like 6-32 x 1 1/2". This means it's a #6 diameter, with 32 threads per inch (almost double the normal thread count as a standard wood screw) and an inch and a half long. When the middle number is absent (6 x 1 1/2"), the screw has the "normal" number of threads per inch for that size and type of screw (for #6 wood screws that's 18). See also here and the original, here. Disclaimer: I wrote the table after more than 30 years in trade (builder/carpenter). Back in the last century when we were not sure of a screw's gauge, a reliable rule of thumb was to measure the diameter of the countersunk head in inches. Deduct from that measurement 1/16", and then count the number of 1/32" remaining. So a screw head with a diameter of 1/4" was a 6 gauge, 5/16" was an 8 gauge, 3/8" was a 10 gauge and so on.